With Field Control, GE IP offers decentralized I/O and decentralized control in a single, low-cost, modular product. GE IP engineers have refined proven technology to create a truly modular system. Each station of a Field Control network can act as a stand-alone controller, allowing for physical separation of logical control functions and faster processing times. As a result, Field Control is an ideal complement for the Series 90 PLC and Genius I/O and offers OEMs and end-users a single low-cost solution for a variety of application needs. 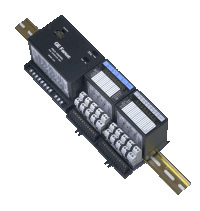 Its decentralized I/O and control produces significant increases in system speed and efficiency, while freeing up panel space and cutting panel wiring by almost 50 percent. CIMTEC Automation has thousands of dollars of Field Control product in stock. Click on a specific part number to learn more about a particular Field Control component. Find Price and Availability on any Field Control part by clicking on the 'In Stock' or 'More Info' button.